UPDATE! The results are in and the Harmony/Saskaņa won the overall election, but to have any power, a party has to have a coalition since no party won the majority. I am not sure what it means, but I think I feel a little disappointed. I do like that all these parties are going to have representatives in the government. The party I voted for didn’t win any seats (< 5%), but they won enough votes to get government funding (>2%) in future elections, which is nice. See the full results here. But one of my Latvian students pointed out that over 80% of them voted in the last election. So I guess it isn’t a problem here. According to this website, Latvia has had a 66% average turnout over the past several elections. I hope today it will be higher. It is a beautiful day, but it seems that some apathy has been setting in. Many people feel that no matter how they vote, nothing will change. Sound familiar? The election here is a bit different than in the States. This site explains it pretty well. Rita decided to become an election official so she could work at one of the voting stations this year. To do that, she had to get some signatures from eligible voters, attend a few training sessions, and then prepare to stand all day today to greet people and assist them during the process. I went to 1. Gymnasium High School, her assigned station, to cast my vote. I rode my bike and expected there to be a line out the door. It was more like a bee hive with lots of activity, but everyone was moving in and out very efficiently. Rita was at the door, and she greeted me warmly and then pointed for me to go upstairs. They have two levels of voting stations. Those who can’t get up stairs can vote on the main level, and those who are okay with climbing can go on up. I am happy that I am still in the “go on up” category! When I got there, I had to wait in a short line. Many people had brought their children with them, and there was an atmosphere of excitement and happiness. I didn’t feel glum like I do when I go to American election stations. I am not sure if it was the location or just the people in general. 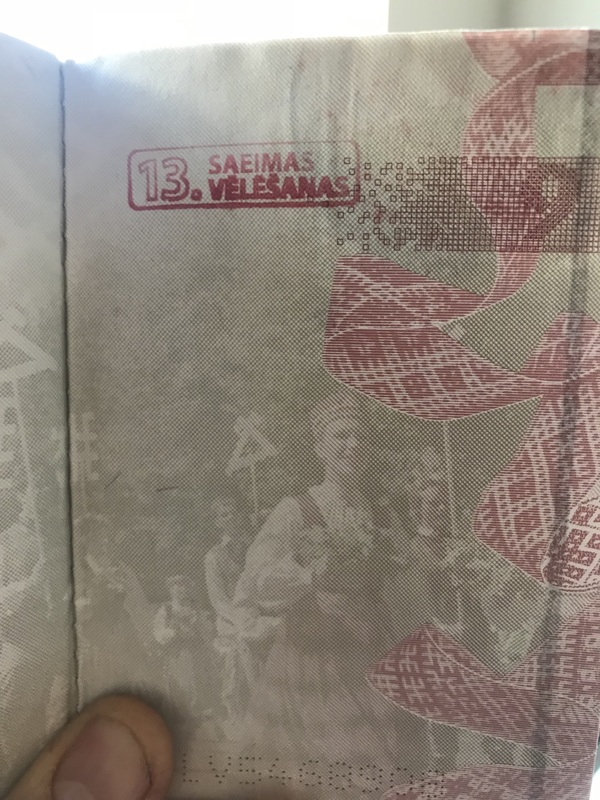 I was quickly ushered to a table, where a nice woman checked my passport and stamped it with the Saeimas Vēlēšanas 13 stamp. She wrote my name on a piece of paper carefully “Džefrijs Č Grīnvalds” and handed me my ballots. There are 16 parties, and each party has a ballot with the names of the members who made their way onto the ticket. Each member represents a district, so the bigger parties have more members representing all the districts. To vote, I chose one ballot, and then I could give + marks to candidates I liked (I chose 3) and I could also cross out members that I didn’t like. I didn’t do that. After I was finished, I wasn’t sure what to do with the other ballots. I looked around and saw a recycling box, and I quickly threw them in. However, I accidentally threw the envelope away too! Oh no! So, I started shuffling through the box which drew the attention of one of the election officials. Busted!!! She came over and started speaking Latvian at me, and she didn’t speak much English. She said I couldn’t vote… I guess she though that because I was speaking English I wasn’t a Latvian citizen. I showed her my passport and tried to explain about the envelope. It took awhile, but she finally got it. I was sweating and scared for no reason. I found the envelope and cast my vote into the ballot box! It was a small, symbolic victory! I have now voted in two different countries! That feels pretty special. I am kind of scared about the election because the pro-Russian party, Harmony/Saskaņa, has been polling really well. 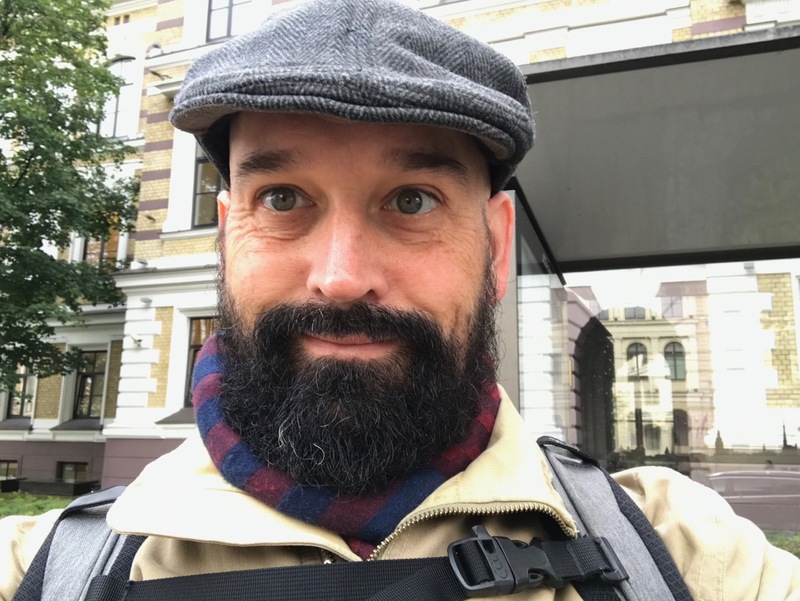 All the general news stories about the Latvian election seem to be focused on the bad news… that either a pro-Russian or populist party will take over. It seems that the journalists just want to make everything seem bad because that is what people want to read. I am more optimistic. Scared, but optimistic. 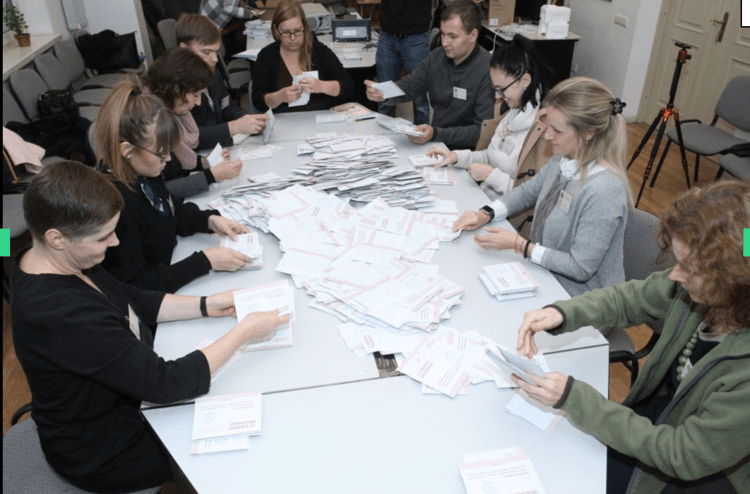 The issue is that while the population of Latvia is mostly Latvian, most of the Russian voters will all vote for the same party while the Latvians will be divided between 14 parties, and their votes will be diluted. We will see how it plays out. LSM is also a good site for general Latvian news in English. These cartoons were there. I thought they were cute.